Name: Describe your task. If left blank, FitnessSyncer will create a default. Sync Time: Specifies the time you wish to synchronize your data. This can be a specific time or hourly if you are a Pro user. Enabled: You must select the checkbox in order to use this destination. If this checkbox is not enabled, this destination will never be ran. 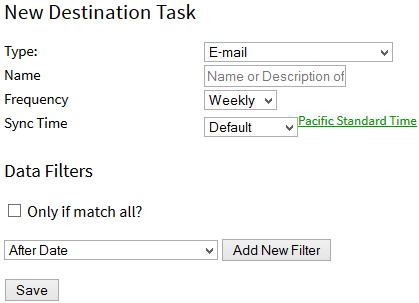 Filters (in Advanced Options): You can filter the data read from this source in many ways; see the Filters section for more information. Note: This is not available within our Apps. Attachment: Include the raw GPX, TCX, KML, KMZ, PWX, or FIT files for your activities as attachments to your e-mail; we recommend this only for Daily Frequencies as the others, depending on your data, may exceed e-mail limits. Note: This is a Pro feature. Send to you and to: Choose another e-mail address to send the updates to. Note: This is a Pro feature. Message for Alternate Message: Provide a little context for this e-mail for the other receivers of this e-mail. Note: This is a Pro feature.